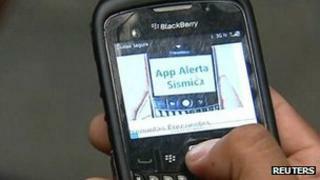 Civil authorities in Mexico City have rolled out a free app that will warn people when an earthquake is imminent. Mayor of Mexico City Marcelo Ebrard unveiled the app on Tuesday, on behalf of Mexico City's Civil Protection service. The app triggers an alarm on the phone once an earthquake of magnitude 6.5 or higher has been detected. On receiving the signal, the phone makes a sound and vibrates, even if the device is set to silent. The app has been developed for Blackberry, according to Mr Ebrard, because only its handsets could send out mass alerts quickly enough: up to five seconds from when the signal is given. Blackberry has been given access to the signal which is operated by Mexico's Seismological Service, which continuously monitors for earthquake activity through regional stations. "If tomorrow someone else does it, we'll also give them the signal," Mr Ebrard said. Although the alarm may only give people a matter of seconds to prepare for an earthquake, authorities believe this may allow them to adopt safer positions, and save lives. In the future, the earthquake signal will be relayed to a system of sirens in the city - but for the time being smartphones are the first line of defence. Last December a 6.7 magnitude earthquake struck the western state of Guerrero, and was strongly felt in Mexico City, causing panic. In 1985 Mexico suffered its worst earthquake, of 8.1 magnitude, which killed more than 10,000 people.